Townsend Harris is a young school with an honored past. In 1848 the New York Free Academy, our first municipal institution of free higher education, was established by the Board of Education due largely to the effort of Townsend Harris who was, at the time, the president of the Board. The Free Academy later became the City College of New York. 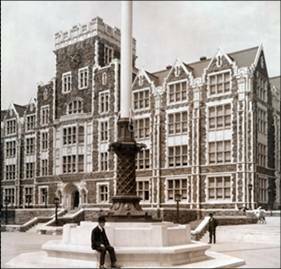 The "introductory year" of the Free Academy grew into Townsend Harris High School which flourished until 1942 when it was closed by Mayor LaGuardia because of budgetary constraints. The original school boasts many notable alumni, including Nobel Prize winners Herbert Hauptman, Julian Schwinger and Kenneth Arrow, Pulitzer Prize Winners Herman Wouk, Ira Gershwin, Richard Rogers, Lawrence Cremin and Frank Loesser and Presidential Medal of Freedom Recipients Jonas Salk and Eugene Lang. Actors Edward G. Robinson, Cornel Wilde, Clifton Webb and Mason Adams are Harris alumni as are Congressman Adam Clayton Powell, Jr. and television writer (All in the Family, the Jeffersons) Bernie West. Townsend Harris High School was refounded in 1984 thanks largely to the efforts of alumni of the original school, who had begun the process in 1980. The first principal was Dr. Malcolm G. Largmann, a former high school English teacher with a strong belief in a classically styled education who also handpicked the school's original faculty. The high school quickly was recognized for its outstanding academic program, being selected as a National School of Excellence in 1989. The new school began life in a small building on Parsons Boulevard, originally intended as a temporary home until a permanent facility could be realized. In early 1995, the school moved into a new building located on the campus of Queens College, where it currently continues to be located. In 2001, Dr. Largmann retired as principal and was succeeded by Thomas Cunningham, who served as principal until his retirement in 2008. Kenneth J. Bonamo was appointed the third principal of the reestablished school in 2008 and remained until June 2012. In August 2012, Anthony Barbetta, the former principal of Thomas Edison High School, was appointed as the reestablished school's fourth principal. Principal Barbetta accepted an opportunity at another school in 2016, and Brian Condon was appointed as his successor in May 2017. Already, the re-established school boosts several prominent alumni, including New York Times correspondent David M. Herszenhorn, entrepreneur Divya Narendra, current Queens State Assemblywoman Nily Rozic, and former Queens poet laureate Ishle Yi Park. Pictured above right: (L-R) Former Principals Thomas Cunningham, Malcolm G. Largmann and Kenneth J. Bonamo in 2010. "You are to be congratulated on the social and intellectual character of the boys whom you graduate." The Director of Columbia College who wrote those words in 1935 to Harris Principal, George Falion, could not have for seen that only a few years later Townsend Harris High School would be declared a "non-essential educational unit" by Mayor Firoella LaGuardia. But this is not the occasion for rehearsing the sad story of the closing of THHS. It is a time for rejoicing in the living legacy which the more than 10,000 Harris graduates have created and are still bequeathing to this City and to the world. Harris men include doctors, lawyers, judges, publishers, journalists, artists, novelists, playwrights and educators. Some live in New York City and its suburbs. Some have journeyed thousands of miles away from St. Nicholas Heights or East 23rd Street. Wherever they may be, they share a life-long bond as graduates of Townsend Harris. For over thirty-five years Harris students were united in the common purpose of completing an academic, college preparatory course in three years instead of the usual four required in. other public and private high schools and completing it to the highest academic standards. To be a Harris man was a condition which engendered a wholesome pride, and the school fostered the confidence that its students had the ability to make their mark on the future. Townsend Harris High School grew out of the "sub-freshman" or preparatory year which City College had offered since its first class entered the Free Academy in January 1849. This fifth year was intended to bridge the gap between the eight years of grammar school education which the city provided and the beginning of College work. In 1897 the New York City established the high school system and soon thereafter the College's sub-freshman year was extended into a three year college preparatory course. Completion of this course guaranteed a place at City College. As the prestige of the Harris diploma grew, its insured acceptance into a wide variety of Colleges throughout the country although about three quarters of its graduates attended City College. Fittingly, this preparatory school was named in honor of the man whose burning desire to extend higher education to all young men who could benefit from it had resulted in the establishment of the Free Academy and ultimately of the municipal college system. When the College moved to St. Nicholas Heights, the building set aside for the preparatory school was the first to be occupied. Aside from the trifling inconvenience of lack of heat, the school completed a successful year from 1906 to 1907 and the Harris students were on hand to welcome the City College men when they moved up from East 23rd Street in the fall of 1907. A memorial tablet to Harris was officially unveiled in May of 1925 and a portrait of "the founder" hung in the director’s office. In 1930 crowding on St. Nicholas Heights caused the school to be moved to the top three floors of the School of Business building on 23rd Street which had replaced the old Free Academy building. Thus the school spent the last decade of its life. on the site of its earliest beginnings: The Harris curriculum had been thoroughly remodelled in 1908 so that students who completed it would receive the College Entrance Diploma newly established by the State Board of Regents. Harrisites made a tradition of doing well on Regents' examinations. In 1915 THHS was reorganized as a separate administrative unit of the College with its own administrative board, a faculty exclusively devoted to high school level teaching, and a Director who served as Chief Executive Officer. Studies in English, foreign languages, mathematics, American history and drawing and physical education and physics were supplemented by a variety of extra-curricular activities which addressed the academic, recreational and religious interests of the students. If we date the beginnings of the "real" Harris system from about 1906, the school could be considered an educational experiment which lasted thirty-six years. What did it prove? .The years which have closed over Harris since June of 1942 have been the years in which many of its graduates have made their distinguished careers. The THHS curriculum and the achievements of its graduates prove that a publicly funded college preparatory school could equal or even surpass, in the quality of achievements of its graduates, many of the most distinguished private preparatory schools. Until the last two decades and perhaps soon again these latter schools have been open only to the affluent. The message of Harris was a democratic message which today is beginning to. sound almost radical: the ability to excel is not the exclusive property of any one group of privileged people but must be nurtured by schools wh'ich are dedicated to that purpose. Surely it was the "mix" of young men chosen by judiciously designed placement tests, an able faculty and a demanding curriculum which created the Harris system and its heritage of accomplishment.